Occasionally, a critic will show up in the comments section of this site questioning my claims of sympathy with civic groups suffering from having had the Middle East conflict dragged into their organization by boycott and divestment advocates. It’s a reasonable challenge, given that I never had anything to do with groups like the food co-op movement or the Presbyterian Church until I became engaged with them over my particular political issue. But such an accusation assumes that engagement can’t involve learning and growth, especially as it provides access to people with whom I can empathize (given that my own journey began when divestment reared its ugly head in my home town a decade ago). Since emotional attachment and empathy are both psychological constructs difficult to “prove” through the written word, let me instead provide an argument over why the PCUSA’s recent decision to return to the BDS fold is such a tragedy (for the Presbyterians, not for Israel), after which you can decide how much such an analysis reflects sympathy vs. sour grapes. Any discussion of American Mainline Protestantism (of which Presbyterianism is a part) must begin by pointing out that the United States was founded and built by Mainliners and entirely led by them until the election of the Catholic John F. Kennedy in 1960. Now their decline in both numbers and influence in the second half of the 20th century has created some anomalous behaviors (best summarized in Rabbi Poupko’s mini-masterpiece Looking at Them Looking at Us), notably a critique of US foreign policy driven by church members who often resemble a retired CEO lecturing successors from the sidelines about everything they’re doing wrong. Such contemporary oddities should not, however, blind us to the remarkable role Presbyterians and other Protestant churches played in creating the founding principles of the nation, including religious tolerance and pluralism. This is not to say that Protestantism is inherently more tolerant than other faiths (as testified by centuries of post-Reformation religious wars in Europe). But in the United States (unlike Europe), no denomination had the numbers to establish themselves as the official state church, which meant that pluralism and tolerance were matters of self-interest to groups that might be a majority in one part of the country, but a minority in another. As Joseph Bottum describes in his book An Anxious Age, this peculiar dynamic allowed churches to foster patriotism based on a shared American identity while also giving institutions with no official role running the country a platform to critique the society in which they lived. And as Mainline Protestantism has declined to the point of potential extinction, no other institution – secular or religious – has been able to provide an alternative moral language to replace the one originally provided by Protestant Christianity. While I can’t argue with any of the particulars Will describes, I would urge people to consider the driving force behind such a process as not hubris but the Common Sense philosophy I talked about a few weeks back. Just as a reminder, Common Sense – like Presbyterianism – originated in Scotland (not a coincidence, by the way) and laid out a means for knowledge creation and societal organization that assumed every question could be answered or problem solved by small groups of committed individuals working together cooperatively. The Church’s decentralized political structure as well as the devolution of powers to the small, local community envisioned by America’s founders all derive from Common Sense principles which many of us still long for (even if we no longer understand what they are or where they originated). But Common Sense ran into challenges the moment society became too complex to allow every decision to be made like a jury trial. Modernity, industrialization, transportation that allowed national and international travel, all led to the rise of a new political order: technocracy, where trained and skilled experts would make a bulk of the decisions on the behalf of the citizenry. Now there is nothing inherently wrong with this new type of power relationship. We all benefit, after all, by having our electrical grids designed by engineers rather than a group of citizens chosen by lot. At the same time, much of contemporary political debate that is force-fit into categories such as Left vs. Right make a lot more sense once you realize that nostalgia for living in a Common Sense community in an era when that is no longer possible drives much of our political thinking (at least at the subconscious level). Unfortunately, if the PCUSA’s committee-based decision making reflects a desire to hold onto Common Sense principles within an institution (or sub-culture), it has yet to come to grips with how much technocrats within the organization have inevitably come to run the show. And unlike the electric grid example I just used, in the case of PCUSA those technocrats are not experts but authorities (the full-time PCUSA professionals working out of Louisville Kentucky) whose decision making is not driven by unique knowledge and expertise but by a political agenda. 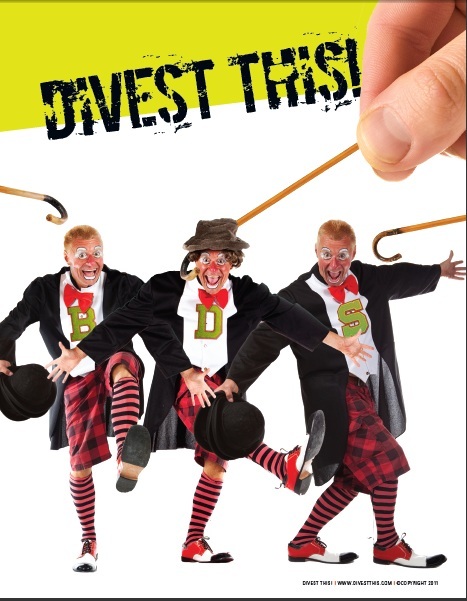 As we have seen over the last ten years of debate over divestment, such agenda-driven authority-crats are more than willing to subvert Common Sense principles in order to get their way. For example, no genuine Common Sense community would be asked to vote in divestment at the last minute of a conference with minimal input from the membership (as happened in 2004). And if Common Sense still reigned within the organization, a huge majority of members rejecting divestment in 2006 would have been the last word on the matter. These new authorities, however, have tools at their disposal that allow them to portray their choices as something other than their own dictates. There is a reason why PCUSA has chartered multiple committees to bring a certain point of view into discussions on the Middle East while Presbyterians who have alternative viewpoints must fend for themselves. And is it reasonable to assume these committees could have become so packed and lopsided without the ascent of the church’s professional leadership? What this all adds up to is a system whereby an elite drives their political agenda within the church while creating the illusion (through a corrupted GA process) that decisions are still being made by the men and women of the pews. In other words, what we saw in Detroit last week was an attack not just on Israel and its supporters, but on the very decentralized, citizen-based, Common Sense principles upon which the Presbyterian Church was founded. I suppose I could channel the spirit of Chicago Presbytery (the one that proposed new church liturgy to make a distinction between the Jews in the Old Testament and the ones living in the Holy Land today) and try to come up with language that would clarify the distinction between the Presbyterian Church which made so much difference in the world during its first four centuries and the mutant entity that traveled under that name in Detroit last week. But feeling more generous than Chicago, I simply wish that those hoping to reform PCUSA back to sanity or, more likely, follow the time-tested American tradition of leaving to found their own alternative, will rediscover those things which led them to Presbyterianism in the first place, including the Common Sense principles that Louisville has worked so relentlessly to eradicate from PCUSA. “If there were no Jews the world would have to invent them. After all,who else would they hate?” Awwww, F#*K ’em all. Am Yisrael Chai now and forever.